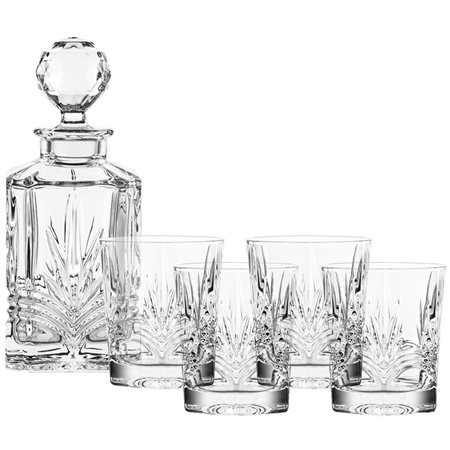 Complete with four whiskey glasses and a beautiful decanter with sparkling stopper and beautifully presented in a gift box the Galway Crystal Kells Decanter Set is a special gift. Galway Irish crystal has a reputation for style and quality with every piece designed to compliment your lifestyle. Bought this as a gift and wasn't disappointed with the quality of weight of this set. Looks stunning but bought at a reasonable price and Belleek customer service was excellent. Thoroughly recommend buying this set if you're looking for the perfect gift. Really pleased with this set. Saw it in Belleek showroom last year but had already spent my budget on other Belleek crystal beauties. Bought it on-line this month for Christmas. Arrived swiftly, well packaged.